Ion Audio’s LP 2 CD turntable helps you bring your vinyl into the digital age, letting you burn your LPs, 45s, and even 78 rpm records to an internal CD-R drive without the need for a computer. You can also record directly to your Mac, but the process can be a bit more complicated. The LP 2 CD is solidly built—much more so than the TTUSB model I purchased a few years ago. It features a belt-driven turntable and a counter-weighted, S -shaped tone arm with anti-skate control. You can connect the LP 2 CD to your home stereo receiver via the RCA line-out ports and use it as both a standard turntable and as a CD player. If you don’t have a receiver, you can use the connect powered speakers to the 1/8th-inch headphone jack and listen to music that way. The LP 2 CD also has line-in ports that let you connect and record from a cassette deck, or other line-level audio components. Its rear USB port lets you connect the LP 2 CD to your Mac running OS X 10.4 or later. The OS recognizes it and loads the USB Audio Codec, letting you capture audio directly from the turntable using either of the supplied applications or another audio editing program. The LP 2 CD can play back audio from your Mac too through the RCA line out jacks or headphones. An easy to use menu system with a two-line blue LED screen and four navigation buttons provides access to the unit’s functions and leads you through the process of recording your music sans computer. 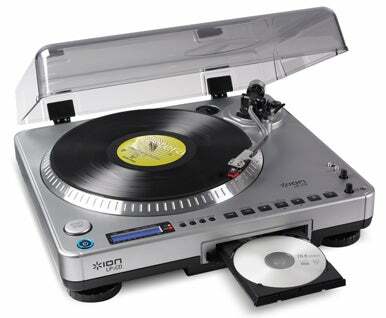 The audio from your vinyl records is first captured to internal flash memory and that data is later burned to CD. According to Ion, capturing the music onto solid-state flash memory eliminates unwanted noise that would occur if you recorded directly to a spinning CD-R. The LP 2 CD has 700MB of available flash memory, enough to hold 80 minutes of CD-quality music. (After burning the data to CD, the menu asks you if you’d like to erase the contents of the flash memory to make room for additional recordings.) A built-in automatic track-splitting worked pretty well, though it did combine two songs into one file—the problem didn’t happen with any other songs I recorded. In cases where gaps between songs are not recognized, you can use the menus to manually split the recorded tracks. Stand-alone recording to CD is easier than recording to your Mac via USB. Ion provides two Mac recording applications on the software CD, Audacity and EZ Audio Converter. The free Audacity is full featured, but its not the prettiest program around and can be intimidating. It offers multiple format and quality settings—such as uncompressed AIFF and lossless FLAC—as well as noise reduction tools handy for removing some of the popping and clicking associated with vinyl records. The back of the LP 2 CD. EZ Audio Converter provides a much more attractive interface and is simple to use. It offers no automatic track splitting, requiring you to push the large New Track button between each song while recording. There doesn’t appear to be any way to change the file type or quality that EZ Audio Converter uses from its default 160-kbps, 44.1kHz MP3 files. When you finish recording, the application presents you with a tagging screen where you type in the artist, album title, and song title for each track. The PC version of the application, EZ Vinyl Converter, can access the Gracenote song database for automatic tagging—a feature sadly missing from the Mac software. And in my tests, iTunes didn’t recognize my burned CDs for the purposes of looking up tag information. I also found Ion’s tech support sorely lacking. A support question I submitted on a Friday via a Web form was never answered. Calling tech support during its working hours transferred me to a voicemail greeting saying the person I was calling was away from his desk. I left a message, but never heard back. If you’ve got a stack of wax you’d like to bring into the digital realm, the Ion LP 2 CD makes it easy, especially in stand-alone, burn to CD without a computer mode. If you do choose to use your Mac, the Ion’s included software ranges from difficult-to-use-but-full-featured to pretty-but-with-limited-functionality. With the tech support problems I encountered, I’d suggest purchasing it locally, rather than from the Ion Website, in case a return is necessary (Ion sells through places such as Costco, Best Buy, Fry’s, and Target).